I don’t like horror stories. Especially creepy and gory ones. I like my share of suspense, and thrill, but movies like Batman: The Dark Knight were cutting it close for me with the whole dark Joker thing. Great movie, but the psychological horror was too much for my little sheltered mind to take. Yet I loved Danganronpa. The character development is top-notch, the characters themselves fun and eccentric and somehow believable, a intimidating yet bonkers villian, and a constant slew of mysteries that keep you actively glued to the TV as you try to solve. I recommend. The concept was a bit difficult to stomach at first, but if you like thrill of solving a mystery against high stakes, don’t mind a bit of gore, and like good characters, this is for you. This review contains more spoilers than Mononkuma has rules in his game. You’ve been warned. Please do not read these spoilers if there’s even a hint of you watching the show. This is such an easy show to spoil, and there are so many twists and turns, it won’t be the same if you know what’s going on. Trust me, watch it blind, then come back! 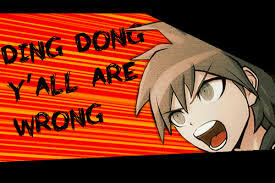 Makoto Naegi was surprisingly fun for such a naive character. I think his innocence works because he truly wants to help people, but is also sort of helpless to do it. He spends most of the series struggling to understand what is going on or failing to rally people to his side (aside from the class trials). It gives him a constant underdog vibe, and avoids the holier-than-tho cliche that some morally good characters have. He’s just a normal guy trying to help his friends. There’s something to that that makes you want to root for him, and the amount of struggle he goes through only adds to that. His early betrayal by Sayaka also makes you feel for him. And as a protagonist, he relies heavily on Kyoko, which is neat to see that he isn’t the smartest of the bunch. He’s just lucky, and full of hope. How can’t you like him? Kyoko Kirigiri has the best surname of the bunch. 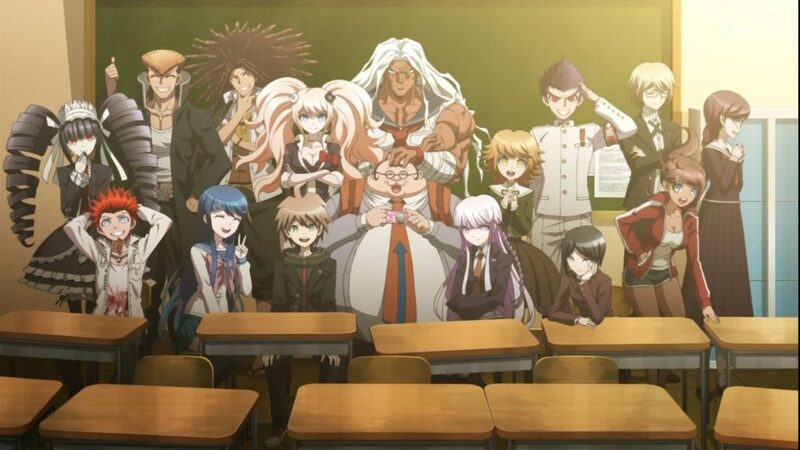 For this reason alone I’m okay with their weird “call everyone by your last name” routine because I get to hear Kirigiri constantly throughout the series. Kyoko’s silent demeanor is intriguing from the start. You suspect she might be the culprit, but then realize that’s too easy at the same time… but still sort of suspect she’s up to something. Her ambiguity keeps you attune to her for the first few episodes, and then as Naegi gets to know her you start to see her open up and understand why she’s so on guard. 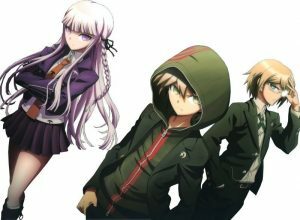 The way she protects herself while trying to keep the group alive is admirable, though as opposed to Naegi, she does prioritize her life first (just not to the point of committing murder). Her betrayal of Naegi is something that I still have trouble reconciling with her character, but I can see how in that moment self-preservation would win out. But after the lengths she went to in order to protect him from harm, I can’t see her abandoning him without knowing that he was going to survive. That bugs me. But overall she was my favorite character, the Sherlock of the group. It was not a surprise at all that she was the Super High School Level (SHSL) detective. I mean, how hard was it to deduce that? (see what I did there?) Watching Kyoko slowly open up and evolve, as well as keep the main plot moving forward, was the one of the best aspects of the show. Her team up with Naegi made the show what it was. Aoi Asahina is a character that I grew to like towards the middle of the show. I really wanted her to survive out of all the non-protagonists. Sakura’s trial added so much depth to both their characters, and I felt so bad for the both of them. 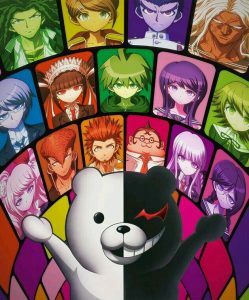 Monokuma seemed like such a stupid gimmick, but it worked so well. The true culprit was a force of her own, and was needed to show how this crazy scenario started and the evil/insanity behind it, but that corny bear added so much dark humor to the show, which was needed given its premise. 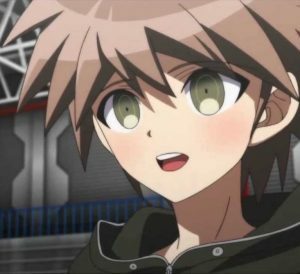 The way it tormented poor Naegi by annoying him and following him around was entertaining, and its blunt, clever insults made me laugh. The investigation, then case structure of the show worked well, giving time for character development and scenarios to unfold, then the trial where you had to solve the case quickly based on the evidence. I’ve heard complaints about the rushed nature of it, but I think it was the perfect speed. As the evidence drops during the trial, you have to piece it together quickly in your mind. It gives you less of a chance to spoil it in your head (which would make the trial quite boring), and makes you more attune to the social interactions taht happen preceding the murder. Who is going to get murdered? Who seems likely to commit murder? All that suspense gets you guessing and on the edge of your seat during the non-trial episodes, and then you have to think back to that during the trial episodes to solve it. Each character got their moment, I think. Heck, I got upset when that poor computer AI died. The victims were all disheartening, as were the bonds the characters formed. 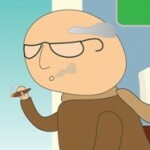 I think the show did an excellent job of foreshadowing with the little details (e.g. Hifumi being subservient to Celestia in earlier episodes). There was even something off about Junko’s death that made you question whether she knew something for a brief second, but then the show went on and I totally forgot about it. The mystery was let out at the perfect pace, with a steady stream of new questions. I actually wondered if the executions were fake when the pictures of the victims hanging together started appearing. Who would have thought those were taken YEARS earlier. After finishing the entire anime series, the premise is just natural in my mind now, but it’s so hard to imagine that through most of this show I had no idea that they all knew each other, and that this had taken place years after their arrival. Just blows my mind. So many good twists, so many! Well done, writers. Well done indeed. The music was phenomenal. Love the opening theme. Love the “episode is going to end” theme that came on and you knew the darn show was ending just as something new came up. The animation style was unique yet fun, which I think is owed to the game. The pink blood was different, yet made the game less gory that it should have been. The weird animation that appeared during the punishment phase was awful, as was the entire punishment phase. 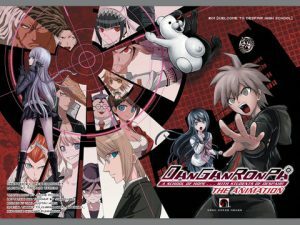 Skipped all of those (except Naegi’s because, well, I knew there had to be something off about it) as I do not enjoy watching people get tortured, and if they die via execution, does it matter to the plot if I know how? Nope. The voice acting was great, as I seem to say for all anime I watch. I feel these dubbers really give it their all. They have the original voice actors to look to, which I’m sure is very helpful, but they also seem to stay true to the character, and really do the best job they can. I’m always impressed with anime voice actors. http://www.behindthevoiceactors.com/ is a regular pop up on my browser. I’m starting to use it more than IMDB. But back on topic — voice actors did a phenomenal job, really made the characters come alive. 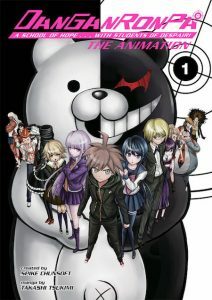 Papenbrook made Naegi feel super innocent, Glass showed Kyoka’s reserved and introspective nature, and Ayres gave us a Monokuma that was pathologically insane. Grelle, Mosier, and Angelle also voiced their characters to perfection, part of the reason I didn’t want them to die (even though the first two’s characters normally would have made me want them offed). While I hated Junko and found myself a tad annoyed with her changing personalities by the end of the last episode (anymore and I would have had to stop), I truly think Marchi did a phenomenal acting job there. So, do I recommend it? Yeah! Watch it! Only thing that threw me off is that everyone is called by their last name. I had trouble following the show at first, because in the game they call everyone by their names. Because that’s what you do in life… Just odd. I know in Japan surnames come first, and it’s like the English dubbers forgot that. I’ve looked online for answers, but have found none. This will continue to bug me. Just… why? Also… Regarding the visual novel — you have to do that before watching the anime, right? It was recommended to me that I try the video game first, or at least watch a Youtube of it. I tried. I did the commentary and commentary-less versions. I had the English audio version of it to watch. I kind of got into it, but it was so tedious, after the first case I decided to try the anime. So much better. That’s not to say the video game isn’t good, it’s just I don’t find them entertaining. Visual novels just seem… blah to me. To those who like them, I’m glad they exist. I can see how you can get so many more hours of enjoyment out of a visual novel versus a show. However, I don’t have that much time, so for me it doesn’t work. Just like how A Song of Ice and Fire doesn’t work for people who don’t have time to read. I love the books more than the show, but I can see how Game of Thrones works better for some people, and I don’t judge them for it. When I decided to switch to the show, I did some research just to make sure (since the video game was recommended), and I was surprised by how much animosity I see when people ask what order they should watch this series in, and people demand that if you don’t play the game, the show isn’t for you. What? Since when do people lose the right to enjoy something just because they don’t like a particular medium. Sure, I feel watching the Harry Potter movies instead of reading the books is an outright sin against the holy and great JK Rowling, but if you enjoy the movies, your call. I’m not going to berate you for it. I guess what I’m trying to say on this soapbox is that you can enjoy this series without having to watch some dude play through the game on Youtube. The sequel doesn’t have an anime, and I can see why. There was a great 15-20 min recap video I watched that told me everything I needed to know, and I’m so glad I did that instead of watching the game. Still got the surprise of the twist, but didn’t have to slog through hours and hours of gameplay to get there. And I didn’t enjoy the characters as much as the original (yes, I did try the walkthrough at first and got to know the characters from game 2), so it wouldn’t have been worth my time. But it’s definitely a good idea to either recap or watch game 2 before moving on to the next anime. Bro: Um, none of them are qualified to be an Brosassins. They plan so much and still get caught. 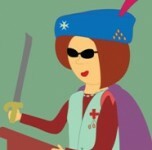 Goes to show, laziness is a virtue, especially for an assassin. And I don’t think Kyoka knows the definition of laziness. She reminds me of Joan. I hated this show. Cleo: Yes. Yes. Yes. Love the suspense. Love the mystery. Kyoko is my hero. She totally would have survived in any era. 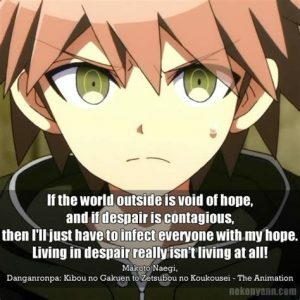 Disappointing that Naegi lived though. He should have been the first to go, given his lanky, pipsqueak, nerdiness. Roma: This is horrifying. I had to stop watching. Yet I’m surprised it hasn’t happened here, given, you know, everyone who works here or attends here? Yes, I’m referring to all of you. ALL OF YOU! [sigh] I work with nutjobs. The opening theme was catchy though. That creepy bear can dance. 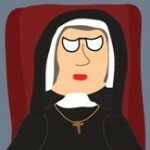 Sr. Joan: Can we do this? If this is legal, we wouldn’t need any more detentions. Get me the lawyer, I need to see if we can make this an annual event.